FORT LAUDERDALE/DAVIE, Fla. – Unlike the rest of the schools in the NCAA, Nova Southeastern University’s (NSU) football team plays on Sundays. That’s because NSU doesn’t field its own football team. Rather, thanks to a one-of-a-kind partnership with the National Football League’s Miami Dolphins, our students root on Sundays. 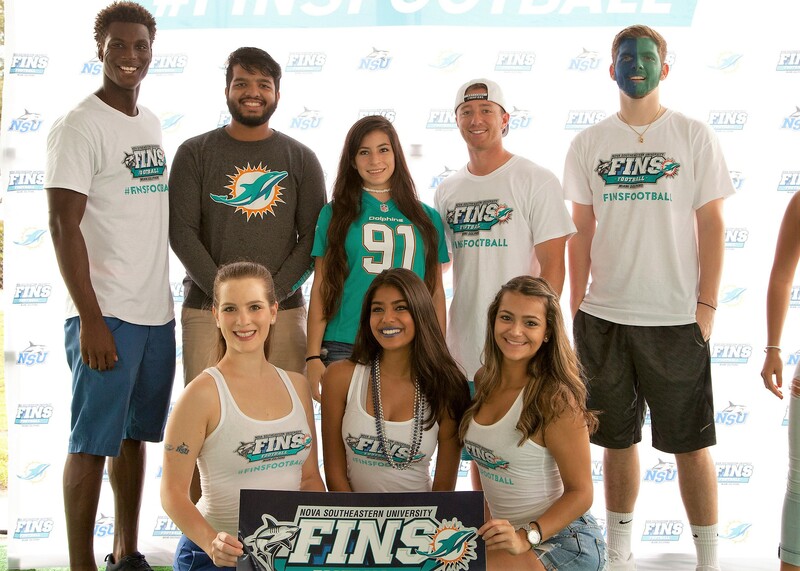 This unique collaboration – Fins Football – provides NSU students with a number of unique opportunities students at other colleges or universities don’t have. First, and most visible, is the chance for NSU students to attend Miami Dolphins home games at Hard Rock Stadium for free. NSU students are automatically eligible to attend; all they have to do is pay a one-time $75 refundable fee. And once they’re in, students can reserve one additional ticket for a guest. In addition, the team has provided a section just for NSU to tailgate prior to games – affectionately called Shark Village (the NSU mascot is a Mako Shark). Complete with games, music and refreshments, the idea is to provide as full an immersive NFL fan experience as possible. During the winter semester, students have the opportunity to attend the Careers in Sports lecture series. Each lecture features a panel of Miami Dolphins executives as well as NSU faculty and staff members who specialize in athletics, fitness and performance, team management, training, and sports marketing. As an added benefit, the Miami Dolphins gives students from NSU the opportunity to apply and interview for paid internships offered during the summer. Previously, students held internship roles in the marketing and communications departments. For more information about Fins Football, visit www.nova.edu/finsfootball.